Path seems to have bounced back from last month's privacy kerfuffle quite handily. The app maker announced today that its API will be integrated into Nike's running apps and accessories. This partnership is the first for the San Francisco-based Path. It will be integrated into both the Nike Plus running app and the Nike Fuel Band. 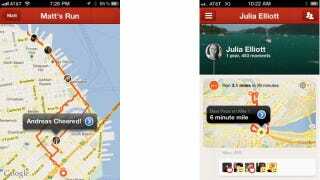 A lot of Path users are also runners, so teaming up with Nike made sense, Path CEO and founder Dave Morin said. By using the app and the band together, users will be able to essentially automate their run data. They'll be able to post route maps to Path and track their progress along it in real-time. Path-connected friends can also monitor the run and provide encouragement in the form of virtual cheering, which plays the sound of real cheering in the runner's headphones. The cheering also activates when a runner passes a predetermined goal point, such as surpassing his fastest pace or longest distance. And, once the run is over, Path generates a new map and marks the spots where people cheered you on as well as records your best pace, time, and total distance. That could be a very cool feature and might get more people off the couch if they knew real people were watching their workouts.